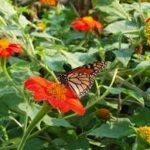 Many summer flowers are beginning to fade as we reach September and October, yet the Tithonia Mexican Sunflower is stunning from mid-summer until frost. Like the sunflowers we are most familiar with, this one grows between five and six feet in height. There are also varieties that are shorter. The major difference is the Mexican Sunflower displays its flowers on multiple branches. I discovered this sunflower in a seed catalogue, and thought I would give it a try. Along with having multiple flowers on each stalk, the flowers are a vibrant red or orange and average two to three inches in diameter. 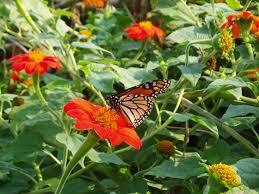 Birds, bees and hummingbirds love the flowers and it is a particular favorite for the Monarch butterfly. I often see birds gathering the seeds from the dried seed heads. This plant likes full sun, but will tolerate some shade. It is drought and heat resistant, as well. It can be started inside in late winter or started directly in the soil after danger of frost is past. Deadhead the flowers to promote more blooms. I save some of the seed heads for the next year’s planting. This is a real statement plant that is deer resistant, has a long blooming season and will reward you with lots of showy flowers that butterflies love!